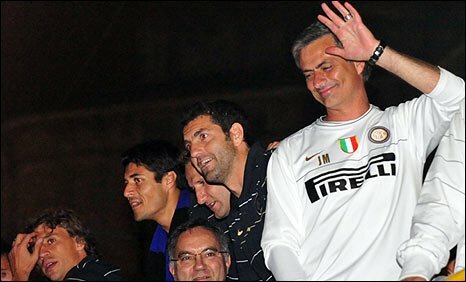 Jose Mourinho celebrated winning the league title in a third country as Inter Milan retained their Serie A crown with three games still to play. The Nerazzurri lifted the title after city rivals AC Milan put in a weak performance to lose 2-1 at Udinese. Inter's triumph, in Mourinho's first season, is their fourth Italian title in a row and their 17th overall. The champions, who host Siena on Sunday, have a seven-point lead with AC Milan only having two games left. AC Milan captain Paolo Maldini, who is retiring at the end of the season, had a night to forget on his 900th appearance for the Rossoneri. The 40-year-old pulled down Antonio Floro Flores on 31 minutes to allow Gaetano D'Agostino to fire home a penalty and then failed to clear a corner before Cristian Zapata slammed the ball in at the far post early in the second half. Massimo Ambrosini headed a consolation for Milan in stoppage time. The first title in Inter's run of four came after Juventus were stripped of the 2006 title in Italy's match-fixing scandal. Inter's second Scudetto - which the title is often refereed to as, and literally means small shield - was a stroll given Juve were in Serie B and AC Milan had suffered a points deduction. Last season Juventus - who sacked Claudio Ranieri as manager on Monday - were rebuilding in their first season back in the top flight. Inter duly won their third title but coach Roberto Mancini was sacked at the end of the campaign after falling out with Inter Milan president Massimo Moratti. The Inter chief then turned to Mourinho, who won two Premier League titles with Chelsea, and he has ensured the Nerazzurri's dominance in Italy continues.